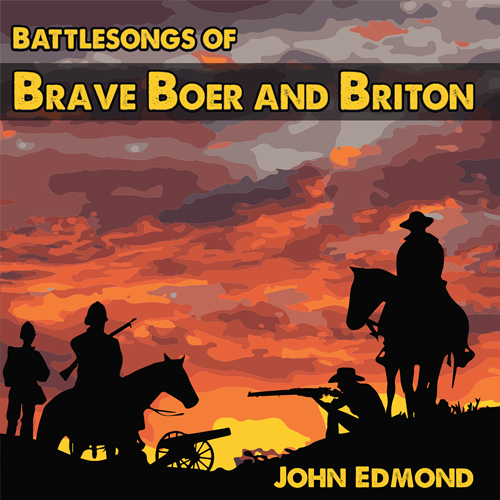 This album is dedicated to the bravery of Boer and Briton together with their allies from Voortrekker times of 1836 up to the Great War of 1914-1918. The bravery of their adversaries can also not be discounted be they Zulu, Matabele or German. Most of these combatants have at one time or another fought against each other or for each other. Angels of Vechkop portrays the bravery of Boer women and children and the Baralong tribe in a battle against the Matabele while Voortrekker Boys documents father and son heroics and Boers assisting Britons against the Zulus at Hlobane in 1879. Lieutenants Coghill and Melvill display courage at the battle of Isandlwana and Brumby-O relates the story of a valiant Australian horse and rider epitomizing the character of their New Zealand, Canadian and Colonial counterparts. On a lighter note, The Whiskey Train describes a train attack with no casualties where war is momentarily forgotten and revelry and reconciliation ensue. Cripple In the Mist tells of a disabled farmer assisting a Boer commando to evade capture by the British risking a charge of high treason. Song For Gideon sings of dashing Gideon Scheepers‘ escapades and him fearlessly facing a controversial sentence and death by firing squad. The Generals were Gentleman describes an incident which portrays the honourable and gentlemanly character of most generals of the era. Avenues of Honour shows the unstinting respect Australians and New Zealanders have for their fallen dead in all wars and how their graves are tended by former enemies on foreign soil and finally The Streets of Dellville wood lead us to the scene of one of the greatest displays of courage shown by South Africans of all creeds, colours and language groups who came together to fight for Britain against Germany in 1916.